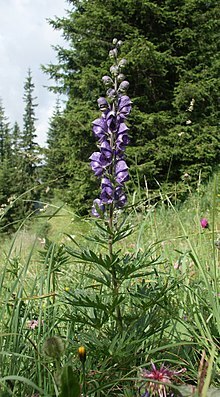 Aconitum napellus (deil's kaips, deevil's mutches, grannie's mutch, Luckies' mutch) is a species o flouerin plant in the genus Aconitum o the faimily Ranunculaceae, native an endemic tae wastren an central Europe. ↑ Chappuis, E. (2014). "Aconitum napellus". The IUCN Red List of Threatened Species. IUCN. 2014: e.T165155A57117867. doi:10.2305/IUCN.UK.2014-1.RLTS.T165155A57117867.en. Retrieved 5 January 2018. This page wis last eeditit on 5 Februar 2018, at 23:59.